There are so many reasons that Christ’s Cross should be on our minds as a Christian, especially because we are navigating the season of Lent—that beautiful and prayerful time of year. Holy Mother Church prods us to become more mindful of Jesus’ Passion and Death on the Cross—His unselfish holy sacrifice so that we might have Eternal Life. We practice the Stations of the Cross devotion on Fridays throughout Lent and we pray to grow closer to Christ and to understand the real meaning of the Cross. The Cross is no doubt, a holy symbol, a constant reminder of profound love. Our Savior Jesus Christ was insulted, tortured and died a horrendously cruel death on a Cross. But the story doesn’t end there, as we well know. Our Lord redeemed us by His holy Cross. Many of us wear a cross around our neck to proclaim, even in a quiet way, that we are a Christian—we are united to Christ. We place images or icons of a cross on the walls of our homes, and we hang crosses over our beds and in various places in our domestic churches. The crucifix that hung over my bed when I was a little girl hangs over my bed today. It is a bit broken, and sadly I don’t have the pieces to fix it. Yet, I continue to feel very blessed that in spite of everything, I still have my cross. There were so many moves from place to place throughout my life, but somehow I managed to keep my cross. Or, rather, perhaps it was God who made sure it stayed with me. Possibly one day I’ll try to mend my broken cross. For now, it speaks to me just as it is. 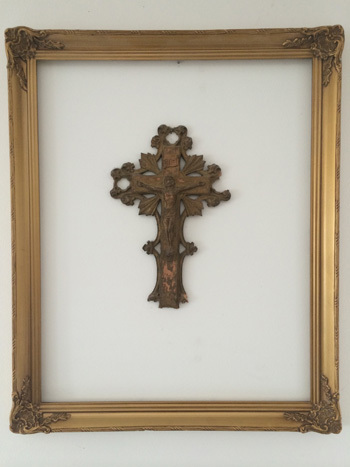 Recently my friend Lucy shared with me about a very special crucifix in her life. 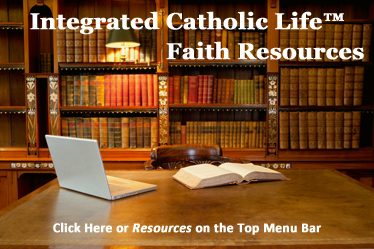 She had grown up in a Catholic home in which a crucifix had adorned a wall in every bedroom. Lucy knew she would have to remedy that situation without delay. Without much means to do so, and because she wanted to immediately bring Jesus’ crucifix into her humble domestic church, she set out the very next morning, equipped with a simple kitchen knife and her creative imagination. She began to investigate the piece of nature that God provided behind her little abode and felt quite sure that she could come up with something, at least temporary. Lucy recalled, “It was like a little forest back there.” She said, “I decided to make a cross with branches until we could buy a crucifix.” Lucy carefully looked around through the brush and trees to find just the right materials to make a cross somehow come to life. 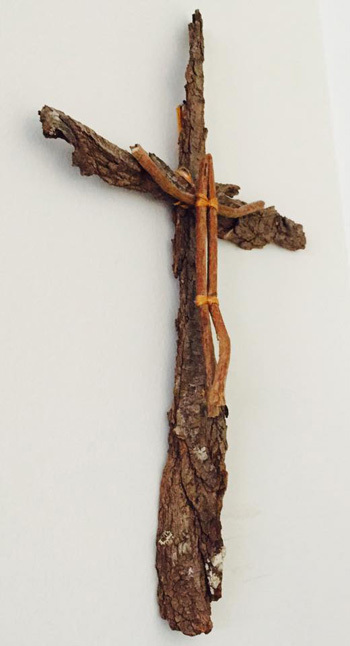 “I saw a tree and I fell in love with the bark and I cut two pieces.” And using sewing thread, Lucy stitched the bark together to fashion a cross. In just a short while, Lucy had herself a cross! Lucy’s inspiration took shape before her eyes. “I can’t begin to tell you how happy I was with my crucifix,” Lucy recalled. She promptly hung it right over her bed. That evening she gazed upon her very simple creation. It seemed to hang perfectly over her bed as if it had been always meant to be there. Lucy told me that it is her Mexican tradition to bring religious items to church and have them blessed by the priest. “The next Sunday I brought it to church so the priest could bless it.” Her parish priest was very moved upon seeing the crucifix made out of simple materials, but clearly fashioned with love. He told Lucy that it was one of the finest crucifixes he had ever seen. Lucy’s handmade crucifix reliably stood watch, hanging in her bedroom for the next two years. At that time the couple traveled to Mexico City’s Cathedral where they decided to buy a crucifix. So, to resolve their dilemma, they decided to hang both crucifixes in their bedroom. “Since then, we have had two crucifixes in our bedroom,” she shared. Because Lucy’s husband is in the military, they have had to move many times. Their one-of-a-kind crucifix has survived eight “military moves” thus far. Lucy never dreamed that the unassuming crucifix she had created to bring peace at night would end up staying with her and her husband for many years. “Last year we moved again,” Lucy explained. “We forgot to put our crucifix away and the packers packed it.” That summer, Lucy had to make a trip to Mexico City. Her husband was at their new home unpacking the first boxes of their move. 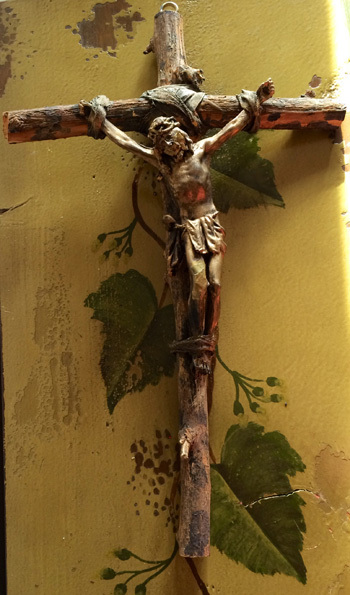 My friend Barb shared a wonderful story about an eye-catching exquisite crucifix that hangs in her home. It completely captured my attention when I first observed it hanging in a prominent place in Barb’s kitchen. I had been admiring it over breakfast and asked Barb about it. So, Barb proceeded to tell me the back story as we sipped cups of tea at her kitchen table. From where I was seated, I could glance up at the large stunning crucifix every now and again as Barb shared her moving story. Her daughter (I’ll call her Jennifer) who had always been excited to be involved at church when she was younger, and later on, when she served as a Extraordinary Minister of the Eucharist, seemed to have lost an interest upon entering college. Though she was always a most thoughtful and caring young lady, “attending Mass was no longer a priority, sad to say,” her Mom lamented. Because of this, Jennifer’s parents kept this situation in their daily prayers. Then one day something seemed to change when this young woman traveled to Ecuador. She had set out with her classmates to volunteer with the local communities in that far away land. While there, Jennifer met an elderly man who made crucifixes for a living. She spent some time chatting with the aged man and decided to purchase one of his very unique hand-crafted crucifixes to give to her parents, believing that they would surely love it. Note: Cross taken off the wall for a better view. Jennifer had thought the crucifix was in perfect shape only to be devastated when she saw its real condition upon unwrapping it! Barb and her husband were perhaps almost as stunned as their daughter. It was such a sight to see. At that moment they couldn’t imagine what was going to unfold because of that mess—how good could possibly come out of that broken cross. But, Barb and her husband tried to do their best in that moment to bring calm and a dose of hope to a painful situation. It’s all they could do. It was also bittersweet. The couple was very moved at the sweet thought that went behind the gift. But they felt so crushed that their daughter’s gift was shattered—not for themselves—but for Jennifer’s sake. She was sobbing. Before parting, the parents reassured their grieving daughter that they would be sure to restore the beautiful gift to its original form. While making that promise they truly did not have a clue as to how they would do it, but they were determined to do so. Jennifer settled down and seemed to feel confident that all would somehow be well. “Back at home, I set all of the pieces on a table,” Barb recounted. “It reminded me of jigsaw puzzle—so many pieces! It truly looked like an impossible task.” As Barb dug further into the project her heart began to sink for a moment as she discovered how impossible it seemed to ever get those pieces back together again. But Barb was not ready to give up. “It turns out that the body of Jesus was hollow, very thin plaster perhaps painted with gold paint. It had appeared the body may have been brass or metal, making it look sturdy; but instead it was very fragile!” Barb recalled the details. “The pieces were paper-thin, and no piece was bigger than a quarter of an inch! I worked with tweezers, trying in vain to get a few pieces glued together, only to have them collapse on themselves due to the nature of the tiny pieces, and the hollow inside of the body.” The hope for the crucifix to ever come together was also getting thin. It seemed to be near impossible. The following day Barb visited the craft store with cross in hand. She was advised to get some modeling putty to pt inside of the body of Christ so she can attach the pieces on top of it. “It worked. But still, finding the right pieces for the right places seemed impossible.” Barb was determined and prayed all the while “for success in my task,” she said. But also her prayers were for something far more important. Barb said she prayed “for the ‘fragile state’ of our daughter’s faith, and thus our relationship.” This project was so much more than simply repairing a shattered crucifix. There was a much deeper meaning attached to this cross than met the eye and Barb and her husband were very aware of God working step by step alongside them. “Slowly, very slowly, the head began to take shape…and suddenly, the strangest piece that I had paid no attention to, I discovered it was Jesus’ nose!” That was the key piece for Barb to make sense out of the puzzle of random pieces. My friend continued her story and I glanced up at the crucifix which was adorning her kitchen wall for all who visited the heart of her home to see. “And it looks nearly perfect!” Barb exclaimed! Barb can’t help but reflect on God’s amazing grace when she peers at that very special crucifix. 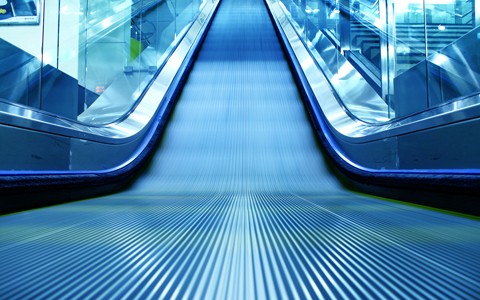 “I needed God’s grace as much as our daughter did,” she recalled. “Especially at that time…The broken crucifix reminded me in a very tangible way that He is near!” she said. Barb knows that the gift from her daughter means so much more than she can ever possibly express. She believes the crucifix and the experience during those three days is nothing short of a miracle. Barb reflected on the many layers of meaning in the extraordinary gift from her daughter. She said she is absolutely sure that she is not finished learning from that unique crucifix. But, Barb is truly aware that the gift from her daughter tremendously helped them to grow stronger. “Our relationship with our daughter was also in pieces, which needed healing and ‘putting back together.’” The gift of the broken cross ended up being very instrumental in the process. It was a present that Barb and her husband never had dreamed of, but one they are profoundly thankful to have received. Their golden crucifix seems to speak volumes from its prominent place hanging in the heart of their home. It’s so much more than an item purchased from the humble craftsman in Ecuador, and more than what it is made up of. It is a heartfelt gift from a daughter to her parents which by God’s amazing grace was accompanied with the special blessing of spiritual growth. This Holy Week let us offer ourselves wholeheartedly to the holy will of God. 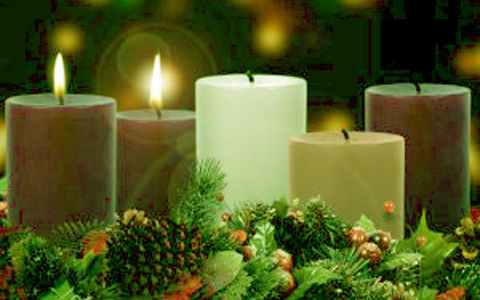 Let’s ask our Lord Jesus to open our hearts fully to Him, to heal our brokenness, and to save us with His holy Cross. Editor’s Note: We recommend Donna-Marie Cooper O’Boyle’s forthcoming memoir, The Kiss of Jesus: How Mother Teresa and the Saints Helped Me to Discover the Beauty of the Cross, available now for pre-order.